Remnants Starting at $3.49 sqft. Description - Designed for heavy duty commercial use, our 3/4” Rubber Gym Tiles are the perfect interlocking tiles for Olympic lifting, Cross Fit and many other extreme exercises. Being an interlocking tile, these rubber tiles are very easy to install and can be cut with the use of a sharp utility knife or saw on low speed. Featuring an anti-skid top surface, these gym tiles are great for areas where sweat and water may be present helping to create a non-slip yet durable flooring surface for your home or commercial gym. 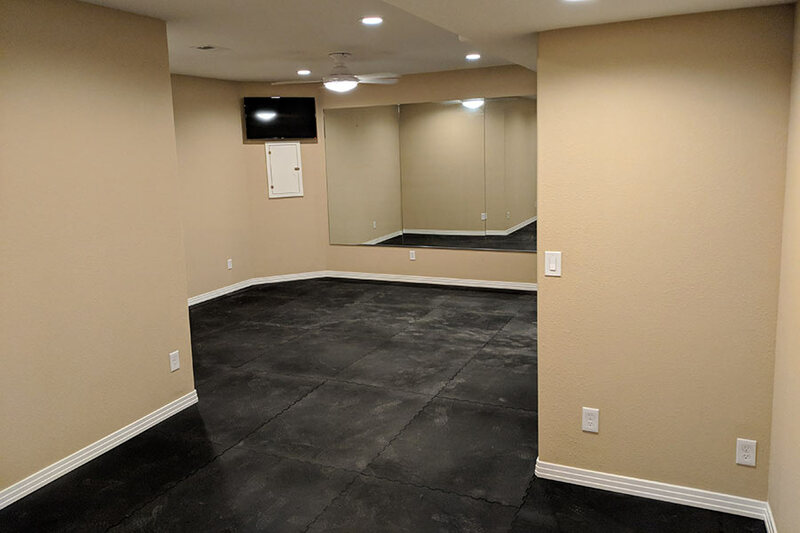 Since these rubber flooring tiles are vulcanized, these tiles are also great for outdoor use and have been used as; equine mats, dog kennel mats, patio flooring, deck flooring, and much more. Note: - Due to manufacturing process and nature of recycled rubber, some surface variations such as color distribution or shadowing may exist. Material – Rubber Gym Tiles are constructed of recycled black rubber buffings and virgin colored rubber flecks at a 25% and 75% color density. These recycled rubber tiles are also vulcanized which means they are formed using heat and pressure to form a solid non porous and non absorbent mat surface. This allows for the rubber gym tiles to have the highest tensile, tear, and abrasion resistance on the market for an interlocking rubber tile. This means ultimate durability and longevity. Weight – Each tile weighs approximately 49 Lbs. 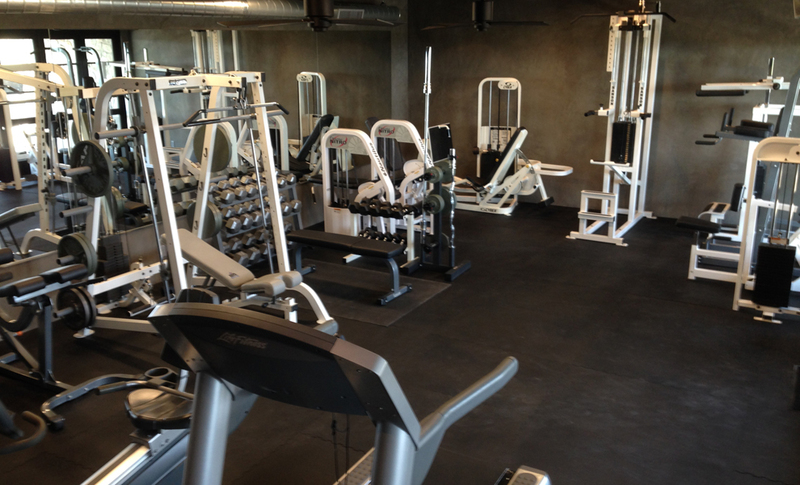 Recommended Uses – The 3/4” thick Rubber Gym Tiles have been used successfully in a variety of commercial applications. Some common areas where these tiles have been used include in power lifting gyms, commercial weight rooms and physical fitness facilities, in physical rehabilitation centers and performance training facilities, in lockers rooms, around ice skating rinks as a blade resistant flooring, in baseball dugouts as a spike resistant flooring option, as doggy day care flooring, as cow mats in barns, outdoors on decks and patios as slip protection, in garages and storage sheds, as horse stall mats, as a utility room flooring, in basement home gyms, as general anti fatigue flooring and sound insulating flooring, as a “green” flooring option, and in any other location where a low cost yet highly durable rubber tile option would be beneficial. Great for both indoor and outdoor applications. Use for Olympic lifting, extreme exercises, horse stalls, doggy daycares and much more. Corner and border tiles can be beveled upon request. Can the rubber tiles be installed on vct flooring? We do not recommend the installation of any rubber flooring over any type of vinyl. Can these tiles be installed over carpeting? 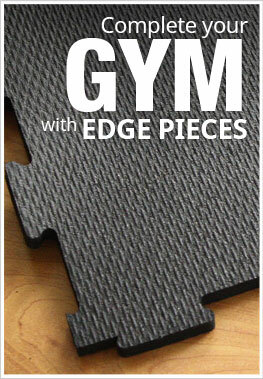 You can install our 3/4" Rubber Gym Tiles over any low pile commercial carpet with easy. You can install our rubber tiles over a high pile carpet with a thick pad, but there may be a separation of the tiles due to the pad being depressed. This can cause a potential tripping hazard. Since these tiles are so thick, the separation may not be enough to be a true tripping hazard, but there is that potential. I have been really pleased with the quality of these floors. They are very dense and resistant to any damage. My clients are able to jump on them and the mats absorb the shock so they don't end up with aches and pains. Only drawback is the texture. It is great for traction but unfortunately shows every footprint so it always looks dirty. I'm hoping after some wear it won't pull as much dirt from shoes. Floor is very good value. At 3/4” thickness and large format tiles, it installs fairly quickly. Takes a while to degas rubber smell, but really helps create the industrial strength feel and function of a professional gym. I have a fairly large workout room in my basement. Recently we decided to renovate and make it even larger. Since I do quite a bit of heavy lifting with dead lifts, squats, etc. I felt it necessary to get a nice thick floor covering. I submitted a few queries regarding several of their products and they contacted me, via email, to discuss my needs. Once settled on the 3/4" Rubber Gym Tiles they worked with me to order the optimal number of tiles that were needed. I sent them a drawing of the new area and they laid out the tiles the most efficient manner possible. Once ordered they arrived on time and I proceeded to install them myself. Keep in mind that each tile weights approximately 50lb, I had 34 tiles so around 1700lbs. Needless to say it took a full day to lay them out and make cuts where appropriate. I ended up with 3 tiles left over; however, that was because I was lucky on a few of my cuts where the discarded piece was able to be used on the opposite side of the room. Needless to say my home gym looks like a professional gym tucked into my basement. Great customer service, great product and very happy with the results. Love these mat!. Commercial gym quality. Complete protection for your floors - heavy weights can be dropped on them without worry. The only downside is the noxious fumes when new. It's been almost a month since I installed them and I can't get rid of the awful odor, but to be fair, any commercial type mats will smell like this in the beginning.